Teachers - are you concerned about your students? I'm sure you know that activities they choose during their school years can play an important role in what they are capable of doing later in life. That's why we want to tell you about TSA, the fastest growing student organization in the nation! Students participate in civic projects, fund raising projects, and scholastic activities related to engineering which can stimulate and motivate them to succeed in school and beyond. Members of TSA learn to be leaders as well as followers, to set and achieve realistic goals, to evaluate their personal values, and much more! We are sure you can see what a wonderful opportunity TSA provides for students! Check out the other links on this page to provide you with more information about WV TSA. We look forward to helping you start a chapter at your school. 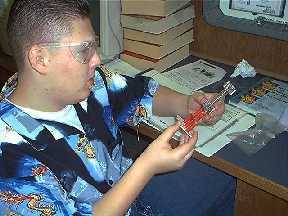 A student is works with pneumatics in a Foundations in Engineering lab. Why Begin a TSA Chapter?